Microbelift Sinking Food Pellets make it easy for your newly added pond fish to receive balanced meals while adjusting to their new surroundings. Usually new fish are shy and will stay in the bottom of your pond until they become more familiar with their surroundings. 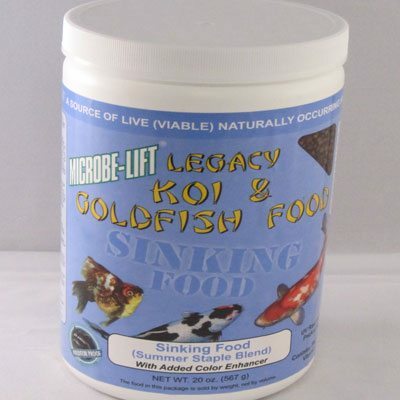 MicrobeLift Legacy sinking fishfood makes it easier for new, stressed or sick fish that won’t come to the pond’s surface to feed off the bottom of the pond. Contains stablilized vit C, 36% protein and won’t cloud your pond water.